Behold, the innards of my 10′ x 15′ locker at Storage Pro in flat, uncelebrated Lathrop, California. I paid CrownWMS about eight and a half grand to cart this gear 5,700 miles east to Spain. Expats-to-be will contemplate similar transactions, may thank me for sharing what I learned. Imagine hiring a crew for a local move in California: from Hollywood to Culver City, say, or from San Leandro to Hayward. The truck pulls up; the crew loads your stuff in the trailer, drives to your new address, unloads. One day. Easy. Please hold this image in mind while eyeballing the Dodger Blue container below. 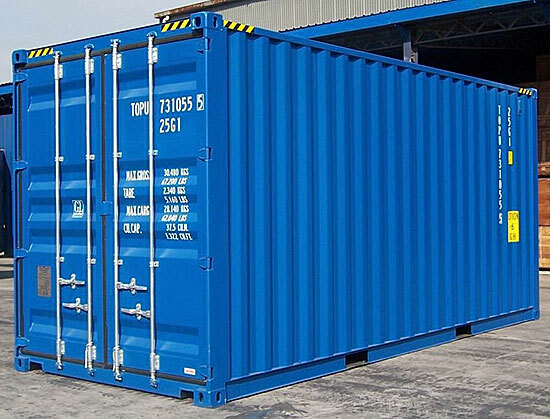 If you’re moving from Hollywood to Paris, Melbourne, Singapore, your stuff goes in one of these guys instead of a trailer. 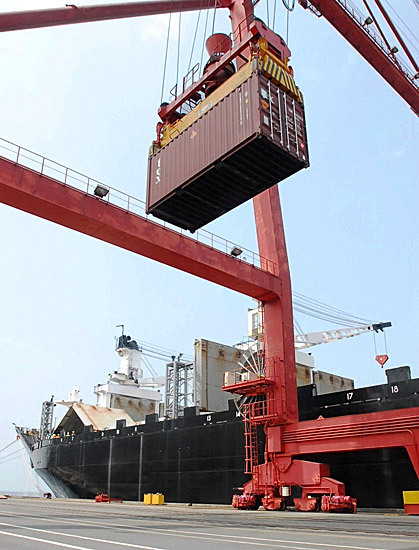 The container is towed to port, loaded (securely!) onto a container ship, and sent on a weeks’ long transoceanic journey to your new expat stomping grounds. Once in port, a destination agent arranges delivery to your new address. No, of course not. You’re crossing national boundaries, are both exporter and importer, whether you want to be or not. Laws. Customs. Thick rule books. 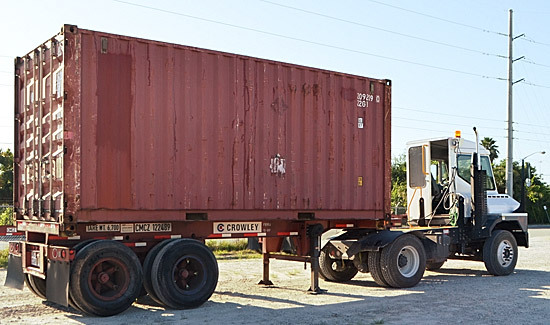 The international mover will want to handle packing, as they must vouch for container contents, will pack more carefully than a local shlepping your gear into a different zip code. I furnished docs and jumped through hoops never encountered in U.S. moves past. Others will, too. But, with that said: your stuff goes in a container, crosses an ocean on a container ship, is opened at your new home overseas. (You can go halvsies on a container with someone else, if so inclined, but don’t need to. I didn’t.) I think better informed writers may scare off potential clients by dog-paddling unnecessarily through some details. It wasn’t that bad. I’d do it again. I realized early in my research that I’d have to trust an unfamiliar partner more than I like to trust strangers on four figure transactions involving precious personal items. I either took a calculated risk or never saw my stuff again in Europe. (♦) International movers aren’t widely reviewed. Netizens will yelp up a storm about the lychee tea in the new boba bar, but infrequently ship Hoosier cabinets to Europe, and thus have little counsel to offer about obscure global movers. I could check a moving company’s membership in FIDI or OMNI, but don’t trust trade organizations to police dues-paying members, and thus felt little comforted. 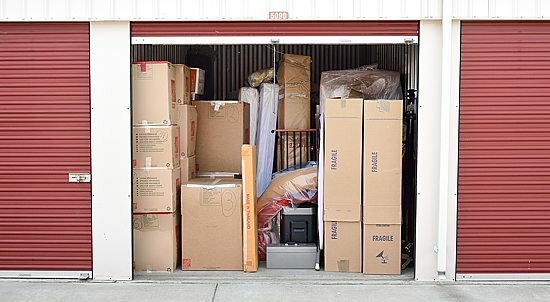 (♦) The fundamentals may be as simple as into-container-in-USA, out-of-container-abroad, but the behind-the-scenes regs and red tape are too complex to be kibbitzed by a backseat-driving client. I saw a just-do-it-the-pros-way process, with little room for oversight or stage management. My online Sherlocking convinced me that Graebel, Stevens and CrownWMS were reputable companies. “You’re gonna have to work with someone, Tim,” I told myself, and picked up the phone, likely with a fatalistic swallow. Well, overall. Not perfectly, but well. On time. Nothing missing. No damage. A score in the ‘success’ column. International movers generally want to visit your home for a free survey. They have to vouch for what’s in the container, expect to do the packing. Alas, I didn’t get serious about the hire until my stuff was in the Lathrop locker shown. Adios Graebel; distant exurb Lathrop was out of their service area. CrownWMS sent a friendly rep to check out my locker. (Maybe he was just looking for an excuse to visit Lathrop, or to brag that he’d been there.) Stevens thought my photos were adequate. I chatted with Janet Bowen of CrownWMS on the phone, judged her as honest and knowledgeable, chose CrownWMS as my mover. Pre-move quotes from Stevens and CrownWMS were similar. I flew to Spain, waited until my Permiso de Residencia was official, called CrownWMS, told them I was ready to wave the wand on my first-ever international move. They charged my credit card 25% up front. I sent locker access instructions and a rough inventory. CrownWMS provided contact information for SpainSIT, the Madrid agent that would take over my shipment after it reached port. I called, was instructed to register my NIE number with the Agencia Tributaria tax agency, and to furnish documents proving that I’d lived in the U.S. (and thus wasn’t trying to sneak intended-for-resale items past customs). My inadequate Spanish made my trip to the Agencia Tributaria more of an adventure than intended, but the number got registered, and my residency docs passed muster. I communicated with SpainSIT in Spanish, but didn’t have to; they employ bilingual staff. Back in California, CrownWMS set a date for the move. The first of two problems arose. A friendly but forgetful CrownWMS staffer had neglected to inform ol’ Tim that someone would have to sign off on the contents of my locker. I had left behind no bosom buddies in Lathrop, and thus had to sign, scan and email a blank inventory form. The move date came. I wasn’t there, but presume that CrownWMS trailered my container into the Lathrop storage facility, transferred the contents of my locker into it, re-boxed and wrapped as they thought appropriate, trailered the container back to Route 5. Problem #2 arose just before my ship was due to leave Oakland. I needed an EIN number. At the last minute. The same well-intended staffer had neglected to apprise me of said necessity. I scrambled, got one in time. 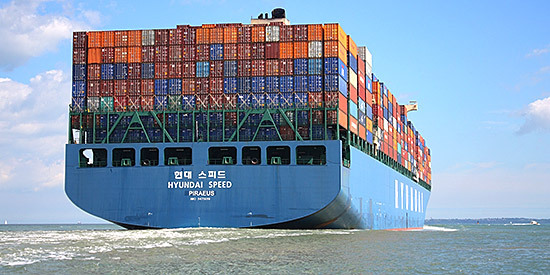 SpainSIT informed me that my container was aboard the SeaSpan Dalian, and showed me how to monitor the ship’s progress as it slogged south to Panama, cleared the canal, headed east across the Atlantic. Date-of-arrival at port in Valencia: October 28. Add a 200+ mile trip to Madrid and processing through customs, and I might see my stuff in early November. The big day came. A SpainSIT crew met me at my Leganes locker with a container-toting truck like the one above, asked me to watch while they exposed the interior to its first whiff of European air, and unloaded the contents into my storage locker. When I finally found the apartment of my dreams, I booked Madrid’s Procoex for the move, judge myself a happy customer. I had a lot of unpacking to do, but eventually reached the box with my Van Halen brown M&Ms test. Son of a gun: there was that pricey 14-24 lens! Everything else had made it, too. Unknown-to-me CrownWMS crew: please accept my apologies for having harbored unjust suspicions. 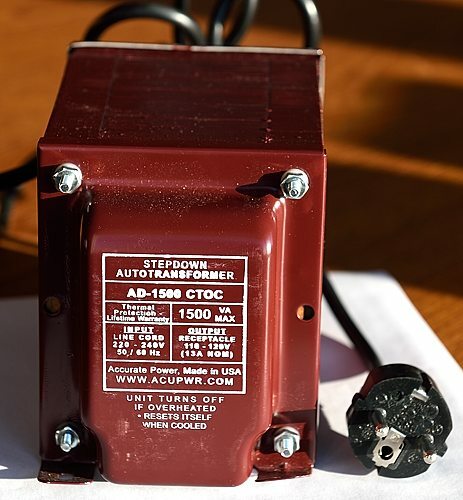 Amazon.es and other retailers sell ‘step down transformers’ to permit operation of 120V U.S. appliances on 230V Spain power. I didn’t like the tenor of some online reviews of these transformers, but felt persuaded by the testimony of an AcuPwr marketing director in an Expat Exchange article. I lack an electrician’s understanding of how transformers work and do not know that the article was accurate. Marketing prof Robert Cialdini might leer at me for associating high price with quality. He might leer with reason; I don’t know’ I thought the article smelled straight, still do, felt impressed by AcuPwr’s online presentation, drank the Kool-Aid, bought the 1500 watt model. My problem: getting my hands on one in Spain. Amazon.es didn’t have it. Amazon.com did, but wanted a mere $610 to ship to Madrid. I could buy directly from AcuPwr, but their shopping cart choked on an international zip. I called, several times, and occasionally felt as if I were yakking with a Mom n’ Pop hardware store. Don’t expect anything like Fortune 100 caliber service from these guys on international orders, at least not yet. When the transformer shipped, it didn’t include the import duty; I had to fork over an unexpected 109 € to the Madrid UPS driver. Ouch. I’m still glad I got it. The transformer weighs twenty pounds, looks ready for a prepper’s bunker, emits no noise and seems to function perfectly. (Albeit after limited testing.) Maybe the cheaper units would have served as well. My bottom line: if it holds up1, I’ll be able to use my pricey U.S. equipment to blend, grind, print and shred in Madrid. (♦) Regard paper documents as an enemy. It’s almost 2017. You don’t want to send bankers’ boxes full of old letters halfway around the globe. Buy or borrow a sheet-fed document scanner and crosscut paper shredder. Scan those stacks of docs to .pdf, back up the .pdfs and shred after you scan. If you don’t know how to scan and deal with .pdfs, get someone to teach you. (♦) I bought two big check-in suitcases (as noted in an earlier post) and flew to Madrid with what I couldn’t live without. I’m glad I took that approach, would recommend it to others. CrownWMS did me right, but I would have survived if my container had tumbled in the drink off Venezuela. (♦) Consider voltage requirements in future machinery buys. Some gizmos can be had only in 120V or 230V versions, but many modern appliances are available in dual voltage versions. (♦) Number boxes and write an inventory of the important stuff that goes in each one. I’m immensely grateful that I moved my gear, but can offer one strong argument to leave everything behind, at least if moving to Madrid: in this city, many of the best apartments are available only as furnished rentals. Landlords stuff the units with a few thousand € of furniture, tack hundreds onto the monthly price tag, rent for a price premium (often for the short-term, without the aval bancario and other hoops described in my last post). 1 Edit, August 9, 2018: It held up. I bought a second, identical AcuPwr unit after writing this post, and both transformers are still going strong almost twenty months later. This entry was posted in Europe, Expat. Bookmark the permalink. Post a comment or leave a trackback: Trackback URL.